team opted for a golf cart. 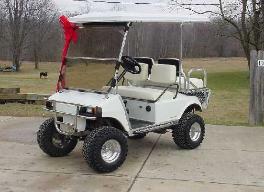 wazoo golf cart that is pictured to the left. custom steering wheel round out the finishing touches. Like everything else we own, we can't leave well enough alone. Cart X page to see what;s new.